Apparently Samsung is preparing a 2-in-1 Chromebook, probably for release next year, at least according to word on the laptop grapevine. The fact that a detachable Chromebook is in the works was actually spotted by Chrome Unboxed back in September, with the device, codenamed Nautilus, being referenced in the Chromium repository. Scant details turned up, though, and all that was revealed about the device is that it’s a detachable hybrid with a Kaby Lake processor. However, now the tech site has found a name which is linked to the device in the repository: Jongpil Jung. Who just happens to be a senior engineer at Samsung, hence the speculation that this Nautilus hybrid is from Samsung. 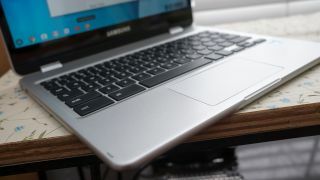 Jung previously worked on the Samsung Chromebook Pro – which we loved in our review – and that’s a convertible (pictured above) with a 360-degree hinge, so the screen can be folded right back to be used as a tablet. But the alleged new device will be a detachable, meaning the display can be completely detached from the keyboard base, which offers one clear advantage: it’s a nice thin slate, as opposed to a thicker tablet with the keyboard folded underneath it. All this is good news for those who might want to use their Chromebook for Android apps. We probably won’t see this detachable Chromebook pop up anytime soon, of course, given that it’s still very much a work in progress, but it should be out at some point next year, hopefully. Fingers crossed that’s the case, because it will provide an even more flexible hybrid option for those who use Chromebooks. Speaking of flexibility, just last week we heard about a new trick which is set to boost the powers of touchscreen Chromebooks when it comes to multitasking with apps in tablet mode.